Dominic de Guzman was a well-educated Spaniard from an illustrious family. He became a priest at twenty-five. When faced with the horrifying results of the religious heresies of his day, Dominic responded to the problem in a deep and lasting way. Religious errors were spread easily because people were ignorant of the truth. More dedicated and knowledgeable preachers were needed to deliver the truth to a lost and misguided world. Dominic laid the foundation for the Order of Preachers (known as the Dominicans). His threefold plan included an order of women, an order of apostolic preachers and a third order of lay men and women living in the world. Dominic tirelessly worked to develop his new order, which expanded throughout Europe and eventually the world. The Dominicans, together with the Franciscans, changed the face of the church and thus the face of the world with their innovative and passionate ideals. 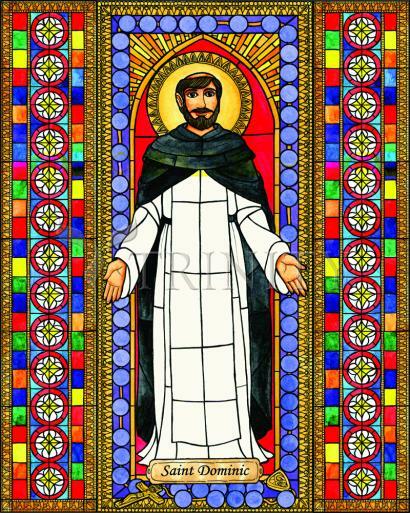 Dominic's personal actions set the example for his followers with a disciplined but joyful life filled with prayer, study, sacrifice, and total dedication to his preaching, which is said to have converted at least a hundred thousand in his lifetime! The ripple effect of one man's response is still reverberating to this day as the Dominican Order remains one of the most vibrant, youthful, and effective orders in the church. All of us are called to be preachers in one way or another and if we arm ourselves with God's truth through study and practice we can all keep the flame of faith from being extinguished just as Dominic did! His feast day is August 8. The Dominican ideal, like that of all religious communities, is for the imitation, not merely the admiration, of the rest of the Church. The effective combining of contemplation and activity is the vocation of truck driver Smith as well as theologian Aquinas. Acquired contemplation is the tranquil abiding in the presence of God, and is an integral part of any full human life. It must be the wellspring of all Christian activity.